I was stuck at home today, playing hooky from work because of a migraine. As the migraine started to ease off, I went on the Internet and started browsing through our list of restaurants. I came across The Daily Scoop, and remembered the e-mails that were passed back and forth between the owner and I after our initial review. She was shocked that we weren't that crazy about the taste, and invited us to try the ice cream at one of their two Rhode Island locations versus getting a pint out of a freezer at a store. Since ice cream always makes a migraine feel better (tee hee), I jumped in the car and headed for Barrington. Before I left the house, Mom suggested that we sample a pint of the exact flavors we had purchased in back February - coffee and banana peanut butter cup. I agreed. I pulled into the parking lot (located behind the ice cream shop) at just about 1 p.m. The first thing I was worried about was the parking. There are NO street spots in front of The Daily Scoop, so already they were earning points because of their large back lot. I spotted an entrance on their deck (facing the back parking lot), but I wasn't sure if that was the proper entry way. I soon spotted a ramp leading up to a second door, so I entered that way. I found myself at the bottom of a few wooden stairs, leading up to a very large ice cream counter. There was one cashier/ice cream scooper behind the counter that greeted me immediately. I was a bit concerned that they wouldn't be able to pack the pints fresh as I hadn't spotted the pint containers yet, but the young girl informed me that she could pack a pint of any flavor I wanted. I chose the coffee and the banana peanut butter cup (which is labeled peanut butter banana) and watched as she stuffed the ice cream into each pint container very quickly and neatly. The interior is quite adorable. Right as I walked through the door I was hit in the face with what smelled like the aroma of homemade waffle cones. They have a large freezer featuring tubs of their homemade ice creams, benches to sit on inside and out, and they even feature Del's Frozen Lemonade - a Rhode Island favorite. Everything was extremely neat and clean, and the bright colors reminded me of summer. The cashier rang me up and asked if I wanted the pints in a bag. I said yes, and my total came to $9 ($4.50 a pint - a little more than the specialty pints at the supermarket). After paying, the cashier wished me well and I proceeded to exit through the front door to get some pictures of the adorable main entrance. When I got the pints home (which had been labeled), I automatically headed for the silverware drawer so Mom and I could dig in. When we opened the pints, they were a little soft from the 30 minute ride back to Fall River. This was fine with us because softer ice cream always has more of a taste than ice cream that is frozen solid. Mom dug in right away, but I was busy scraping the remnants off of the inside cover. The first thing I noticed was the extreme banana taste. This wasn't banana flavoring - it was actual banana. Mom was amazed at how different her coffee ice cream tasted from the first time she had it. This time the coffee tasted deep and rich, and the entire pint was full of coffee flavor. The texture was smooth, creamy, and didn't taste like it had been in a freezer for months. My banana ice cream was also smooth and creamy, and the peanut butter cups were minced so that you a) didn't choke on them, and b) could taste the peanut butter inside of the chocolate. It was so tasty and different. What a vast improvement from our last review! 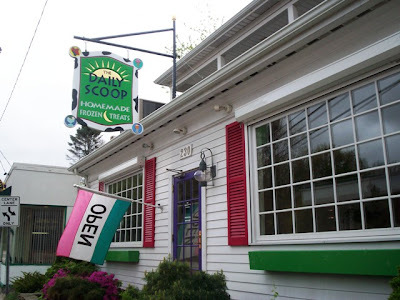 A word to the wise - if you want to have delicious ice cream, please try The Daily Scoop. However, if you buy this ice cream in a freezer and for some reason it's not that great, put your spoon down and head for the shop. You will not be disappointed. Like any normal day, Mom and I were craving a pint of ice cream. Not just any ice cream - homemade, local ice cream. Mom had read about this place in Westport that makes ice cream from scratch, and sells it at Lee's Market in Westport, MA (796 Main Road). Lo and behold, we were at the Target in Dartmouth - the neighboring town. Naturally, going to Lee's had to be our next step. When we arrived at Lee's, Mom and I headed straight for the freezer section. We spotted a lot of different homemade ice creams, but none were from Westport. Disappointed, neither of us wanted to walk away empty-handed. 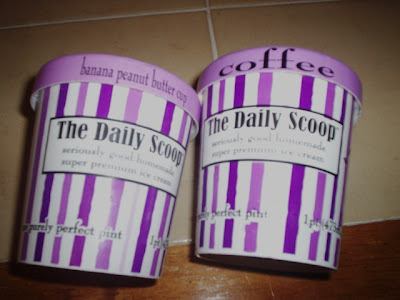 Mom noticed a stack of purple and white striped pints of this ice cream from a place called The Daily Scoop. Made locally in Barrington and Bristol, RI, the flavorful choices surprised both Mom and me. At $3.99 per pint, we spotted flavors like lemon custard, banana chip, black raspberry chip, kahlua fudge brownie, vanilla, pumpkin, butter pecan, coconut almond chip, and peppermint stick. I spotted something called banana peanut butter cup, which mixes two of my favorite things. I quickly grabbed that one from the freezer. My mother chose - are you sitting down?? - coffee. Yep - her favorite flavor, and the kind she always gets. She said that by eating the coffee pint from The Daily Scoop, she would be able to judge it against brands like Haagen Dazs and Ben & Jerry's. *sigh* We made our way to the register, and Mom shelled out $7.98 for the two pints. The cashier loaded them into a paper Lee's bag, and we headed back to my car. I figured that we would probably eat them when we watched American Gladiators at 8 p.m.
At around 7:30 p.m., I couldn't take it anymore. I was dying to see what the ice cream tasted like. I told Mom that I was excited to try it, and - guess what - so was she! Big surprise. I grabbed the pints from the freezer, handed Mom her flavor, and dug into mine. Now I should mention that, at the Lee's register, we both noticed that the pints felt a little light. We were hoping that this ice cream was not the airy, churned kind that you often see at the supermarket. We really don't care for those. 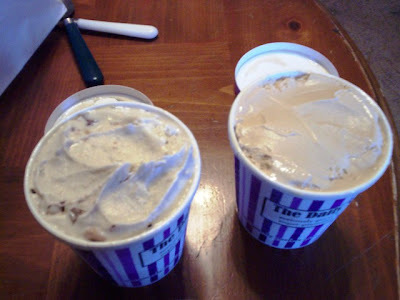 However, after a bit of research, we found that The Daily Scoop pint and the Haagen pint weigh exactly the same. Go figure. I kept waiting for Mom to be bowled over by the taste of her coffee ice cream, but it never really happened. She thought the ice cream had only a slight coffee taste versus the bold taste that you find with Ben & Jerry's or Haagen Dazs. She felt that a homemade ice cream should be very dense and creamy. However, this one was very light and airy with more of a texture bordering on ice milk rather than a premium ice cream. In all, she was a little disappointed with the flavor and the mouthfeel. Doesn't the flavor "banana peanut butter cup" sound exciting? Well, it wasn't. Like Mom, I thought that the flavor wasn't totally there. Even the real Reese's Peanut Butter Cups seemed to get lost in the bland banana ice cream. It almost tasted like ice cream that had a bit of freezer burn, or the scoop of a supermarket brand that was nearing the end of its half gallon. It just tasted different. Mom checked the label and we found that both ice creams were made with nonfat milk, but we didn't want to blame the milk in case all pints are made with this same type. All in all, we were both fairly disappointed with our pints. Don't get me wrong, we ate every bit of it, but we weren't as happy as we are after eating other brands. There are also special coupons available for printing, as well as a list of supermarkets that carry The Daily Scoop pints in their freezer sections. In the history area of the Web page, I learned that owners Bob and Deb Saunders actually met and fell in love over their personal obsession with ice cream. My question to Deb is ... does Bob have a brother? It must be very hard to make ice cream from scratch, and we certainly admire the initiative they have to create all of these interesting flavors. I can't say that we'll never eat another pint from The Daily Scoop, but we definitely want to visit their locations instead. Perhaps the ice creams will taste a bit more fresh and delicious. 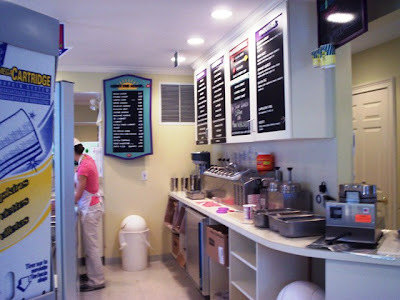 The Daily Scoop in Barrington is open every day from 12-9 p.m. The Bristol location is open from 12-9 p.m. Monday through Thursday and Sunday, and 12-10 p.m. on Friday and Saturday.